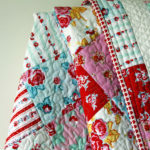 Don’t you love it when you see a photo of a quilt that takes your breath away? My friend, Linda Reim’s quilt, Fiesta, did exactly that. Linda’s colourful collection of Fiesta dinnerware inspired her to make this glorious Fiesta time quilt. The blocks are a mix of vibrant Kaffe Fassett prints and Marquee striped fabric. Linda used Elisa’s Backporch 8″ Rainbow Templates to cut out the pieces, then stitched them together by machine. Linda has made Fiesta to be used as a tablecloth and I can only imagine that being surrounded by such scrumptious colour would also be a feast for the eyes. Quilt photos courtesy of Linda Reim. 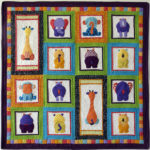 I saw this awesome quilt design on facebook on Kaffe’s page and am so thrilled that I found you! Now my resolution to NOT start anything new has to go out the window. I am in heaven. Thank you for your comment. It is a heavenly quilt!